Note from November 6, 2016 – I wrote this post over a year ago for a blogging class. It has some quirks related to the assignment, but otherwise it’s still applicable. I’m taking Blogging 101, and my first assignment is to write and publish a “who am I and why am I here” post. It might seem a little late for that, but I lean toward the comparative side of things, so I look forward to comparing this post with my original About statement. It will be fun to revisit that, and it should help me assess my goals for the next few months. 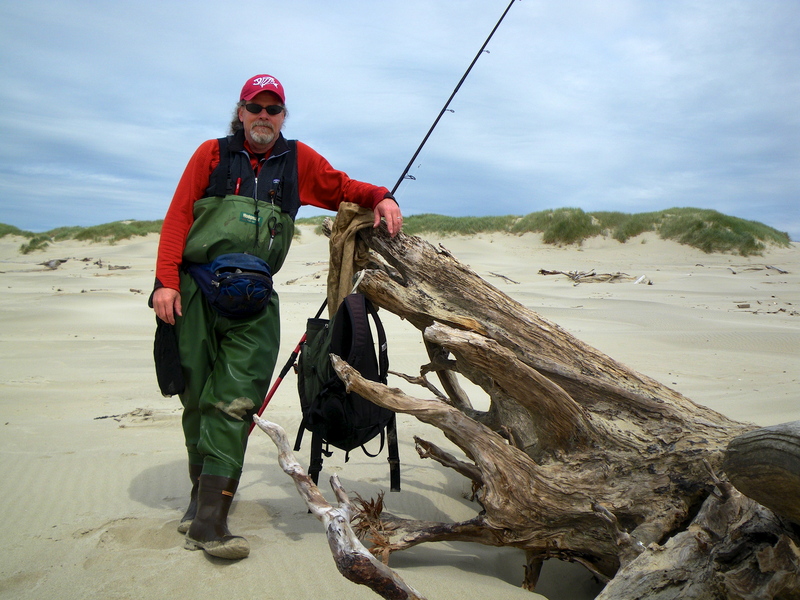 I used to spend a lot of time on the beaches of northern Oregon, fishing. Eventually, I had so many ideas about fish and their predators and prey in the surf zone, not to mention ecological connections to other ecosystems, that organization was becoming tricky. And I had a ton of photos too. Thus, the origin of the outershores had a lot to do with curating all these ideas and images. 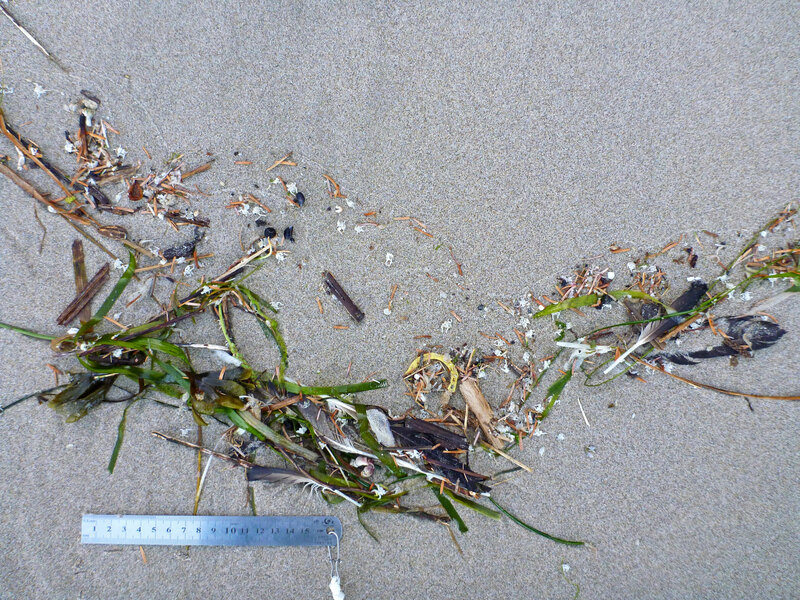 theoutershores is a marine biology web page, fundamentally about surfperch and the natural history of sandy beaches. It is strongly rooted in a recognition of surf zone connections to other coastal and marine ecosystems such as estuaries, the rocky intertidal, and the subtidal zones. I guess you could say theoutershores is a running account of my thoughts and experiences on the exposed outer coast. I’ve always got some projects going on like tallying the contents of the driftline. All this stuff was left behind by an 8.8′ high tide, just after 2:00 am, a couple days ago, on July 4. This year I’ll be counting the items in a bunch of photos like this, and maybe I’ll even publish a post about my findings. Theoutershores is kind of like a personal journal, but I have good reasons for blogging publicly. First, I wanted to tell the story of what I was doing out on the beaches. The standard, easy explanation- fishing, was utterly inaccurate. Now that theoutershores is more established, my transparency reason is no longer as important as it was in the beginning. My second reason is is about making more contacts with great naturalists. You see, I have a lot of questions about the species and ecosystems I write about, and I frequently find myself looking for feedback on things like tricky species IDs. Finally, I want to help people find information and photos about things they are interested in. This has been an evolution for me, personally; early on, I guess you could say I was kind of closed off about sharing. Now, it has become the most compelling reason to share my thoughts and experiences publicly. If I blog successfully over the next year, I guess what I hope to accomplish is to connect with a few more naturalists of all kinds and, for sure, to become a better- more interesting- writer. Oh, and maybe learn how to better integrate social media into my routine blogging. Blog on, minustide, blog on! This sounds like a fascinating blog. I’ll be learning about something I never knew I wanted to learn! Thanks! I’m looking forward to journeying through Blogging 101 with you. The sandy beaches of the eastern Pacific are a fascinating and unique ecosystem that long have languished in the shadow of their better-studied sister habitat, the rocky intertidal. You are exploring uncharted territory, Steve! And you’re doing great service to natural history, science, the environment, and to yourself. Blog on! Thank you, Mike. I respect your thoughts on this. Today is day 2 of my blogging class, so blog on, I will. you are an inspiration.